Well, I usually share with you my monthly letter on the first of the month (or the first Monday of the month). But last Monday, I felt compelled to give you a personal update. And I cannot thank you enough for all your heartfelt messages of kindness and encouragement. Thank you from the bottom of my heart. As I mentioned in my note last Monday, my One Little Word for 2019 is forward — as in let’s move forward! Let’s do this one thing: forget what lies behind and strain forward to what lies ahead. So, let’s do just that… It’s time to reveal January’s word for the month, as well as the color for the month. Okay – I’ll preface this by saying this “word” (or phrase, as the case is this time) is controversial amongst the team here. In fact, I’m somewhat surprising them and changing things up by using this word / phrase. When I threw out this phrase as a possibility for the word of the month, the girls voted no to this idea. They didn’t think it was very compelling or motivating or exciting. But with the word (or phrase) of the month selection, I always have to keep it real with where I am in life. The January phrase of the month is “back to basics”. And yes I agree with the team — not the most exciting set of words ever. But you know what? Sometimes we need a good reminder to not neglect the important areas of life. And I know for me personally, I let a lot of things fall by the wayside during the second half of 2018. I just didn’t have the capacity from an energy standpoint to deal with much. But January is a perfect time for a little wake up call. After all, what we do this month will set the tone for the rest of the year. So, while the topics this month might not be super glamorous, my hope is that getting “back to basics” will help us all to lay a great foundation for this year! We will be talking business, finance, home, food, and much more over the remainder of the month. So, hang with me here as we take care of business to set the right tone for 2019! 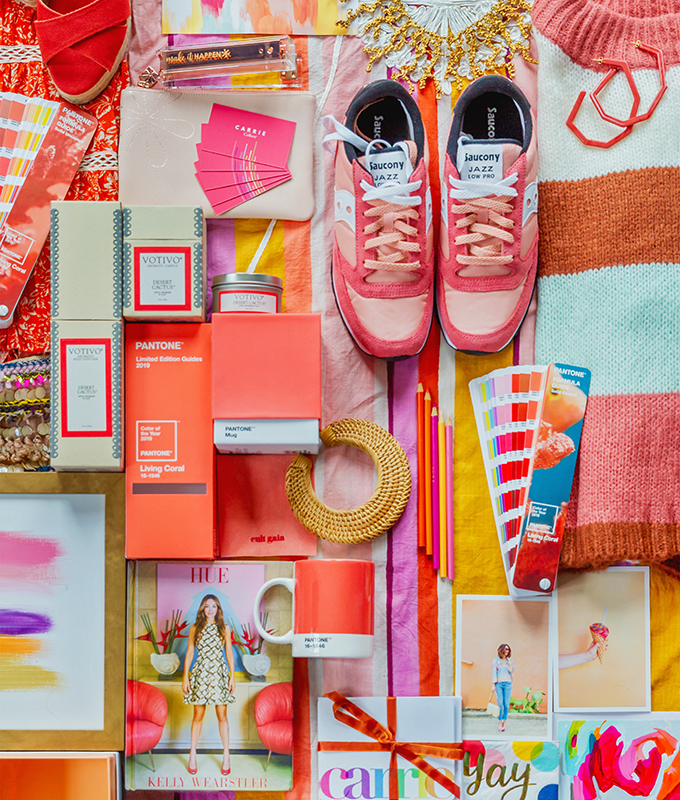 As for the color of the month, given that our tagline is “More Color, Please!”, it’s practically imperative that we should dive deeper into Pantone’s Color of the Year, right? 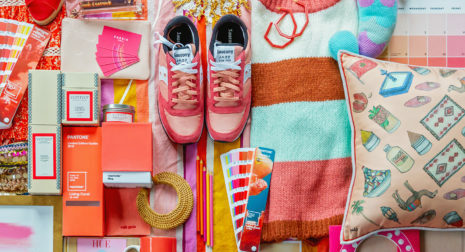 In case you’ve been living under a colorful rock, color authority and trend predictor Pantone has selected Living Coral as the Color of the Year for 2019. When the color was announced in December, we immediately wrote a primer for you on the hue. But this month, we’d like to take the discussion deeper — how to wear it, the psychology of the color, how to incorporate it in interior design, and more . As I mentioned in December, I was initially unsure about the color choice. And I still remain undecided to be frank. I think we will all warm up to the color in spring and summer months. In the meantime, let’s learn all we can about it! 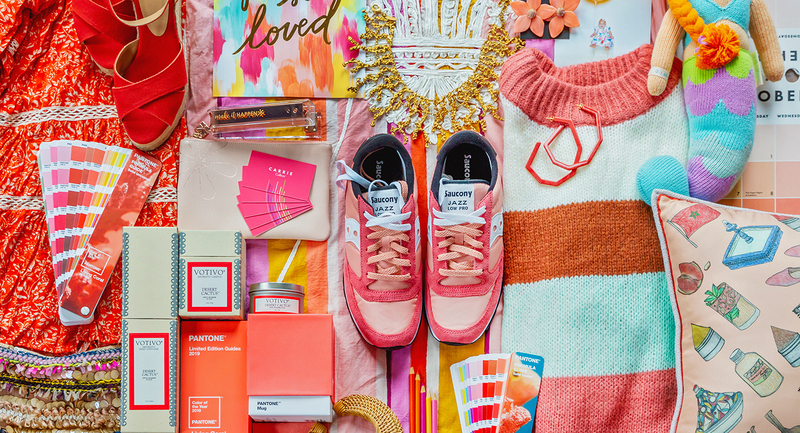 A special thanks to Votivo, Saucony, a bientot, and Shop CJW for contributing their beautiful living coral pieces to our mood board. We’re so excited for the rest of the month (and year! ), and we hope you are, too. Thank you, as always, for reading and your support. It means the world to us. Be sure to check out our ‘color of the month’ shop full of beautiful living coral items. We’ll be updating it throughout the remainder of the month, as well, so keep checking back. I like the back to basics start! Because I can do basic! 🙂 Looking forward to this month’s features! Back to basics sounds great to me! Right? Sometimes we need to refocus! Just because fall is here doesn't mean your wardrobe needs to take a neutral turn. Try out this colorful outfit formula.